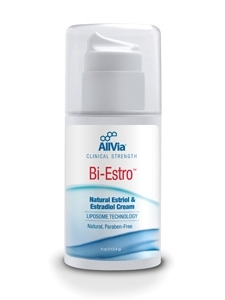 AllVia® Bi-Estro™ contains an 80/20 combination of two estrogens. Each full press of the pump provides approximately 1 mg of Estriol and 0.25 mg Estradiol. 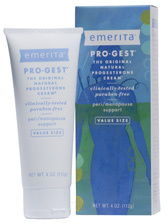 Bi-Estro™ is formulated to contain 24 mg of Estriol and 6 mg of Estradiol per ounce. Each container contains four ounces or 90 plus doses, enough for three months. Special note: Each order comes with a summery of practical knowledge on how to maximize your best outcome. Information is updated regularly from extensive feedback from daily clinical use. The updates are obtained from physician interaction with patients and users of this brand of bioidentical estrogen. Directions: Apply once or twice a day or as recommended by your healthcare practitioner. Dispense Cream into the palm of your hand and rub onto the skin of your chest, abdomen, inner arms or thighs - rotating area each time. Warning: For external use only, not ingestion. Avoid contact with eyes. Keep out of reach of children. If irritation, redness or discomfort occurs, discontinue use and consult a licensed healthcare practitioner. Ingredients: Bioidentical hormone Estriol, Estradiol, Purified Water, Glycerin, Aloe barbadensis, Butyrospermum parkii (Shea Butter), Caprylic/Capric Triglyceride, Helianthus annuus (Sunflower) Seed Oil, Stearic Acid, Glyceryl Stearate, Isopropyl Palmitate, Stearyl Alcohol, Phenoxyethanol and Caprylyl Glycol, Lecithin, Potassium Sorbate and Sodium Bicarbonate.